Some view Sophia as a separate deity apart for God. Some view her as the Bride of Christ. 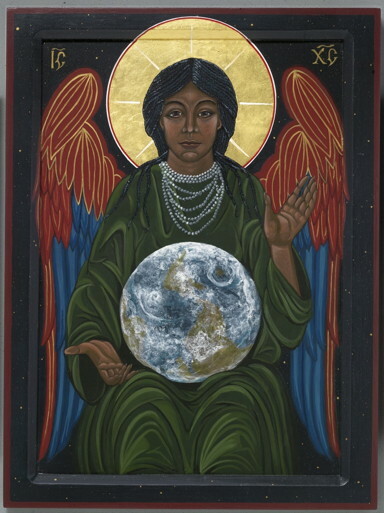 Others see her as a feminine aspect of God or a theological concept regarding God’s wisdom. There are also some NeoPagans and Wiccans who have taken her under their wing as well. Sophia predates Christianity but it is also possible that some Wiccans and NeoPagans adopted her from Christian sources such as Gnosticism. I need to do more research on this subject, but if anyone out there can has information they can share, please let me know. For some Christians. the idea of including Sophia in their worship is unthinkable. For others Sophia is the aspect of God we’ve been missing from our patriarchal faith for way too long. Not surprisingly, I fall in the second camp and see her as Hagia Sophia which means “Holy Wisdom.” While some see the Holy Trinity as three masculine persona, others, like myself, see Sophia as the Holy Spirit who guides us with her divine wisdom. Could it be that Sophia is one of the things that links Pagans and Christian together? I think so. Some Christians see this as heresy, but that’s a label we place on things so we can dismiss them easily. Sophia is part of my personal devotional life. I dine at her table often and am blessed by her many insights. If you also feel a connection to Sophia, I’d love to hear from you! This entry was posted in Goddess, Prayer, Spirituality and tagged holy spirit, holy wisdom, Sophia, Spirituality, Wicca, wisdom. Bookmark the permalink.